Box 456-2 dispatched at 2038 hours for a report of a garage fire at 5961 Acorn Drive in the Chambers Hill section of Swatara Township. Units on the initial dispatch were Company 456 (Chambers Hill), Engines 41 (Bressler), 44 (Lawnton), 45 (Rutherford), Truck 48 (Hershey), Rescue 49 (Swatara Township), and Air 41 (Bressler). Responding companies were advised by County Fire of multiple calls being received for smoke from the garage spreading into the building. Chief 456 arrived on location reporting a working fire, 2 story single family dwelling with attached garage, and requested the first engine to lay in from a hydrant to the scene. 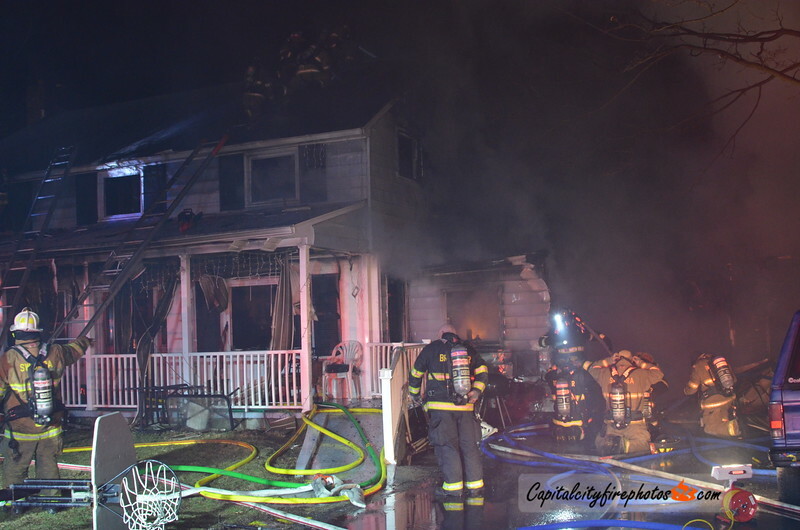 At 2042 the first alarm assignment was requested bringing Rescues 88 (Middletown) and 35 (Linglestown) to the scene. While companies were stretching lines heavy fire started to consume the garage. Engine 41 crew stretched an attack into the front door of the dwelling to try and cut off fire spread that was occurring in the kitchen area. Heavy fire consuming all floors on the C/D corner forced companies to evacuate the structure and go defensive. Command 456 requested a second alarm at 2057 hours consisting of Engines 40 (Paxtang), 59-1 (Lower Swatara), 45-1 (Rutherford), Truck 88 (Middletown), Rescue 46 (Hummelstown), and Air 35 (Linglestown). Blitz fires and handlines were used to knock down the bulk of the fire in the garage, which contained hoarding conditions. The fire was knocked down in about 30 minutes with extensive overhaul required before the fire was declared under control. Primary and secondary searched were negative. One firefighter was injured and transported.